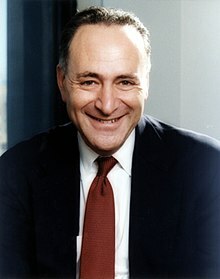 Charles Ellis "Chuck" Schumer (born 23 November 1950 in Brooklyn, New York) is a senator frae the Unitit States. He is senator for New York syne 1999, an Senate Minority leader syne 2017. This page wis last eeditit on 25 November 2018, at 15:16.